My parents used to have fig trees in their backyard. Though my dad currently designs software and my mom is a registered nurse, their backgrounds were originally in agricultural science. They have an enviable garden which grows everything from peppers to eggplants to squash to amaranth. Unfortunately the said fig trees were not as successful as some of the other plants. They were actually more like saplings which my dad was trying to grow into full-fledge trees; they didn't make it through the hot Texas summers and frequent droughts. Even in the few seasons they did produce fruit, my parents rarely got the opportunity to eat the figs they had worked so hard for as the birds would inevitably get to them first. When I picked up a box of figs, I racked my brain for what I could use them in. 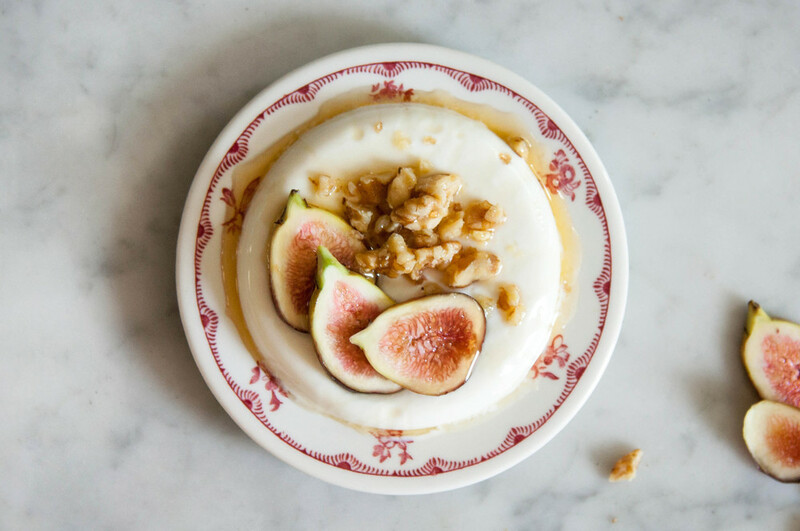 I finally landed on a simple panna cotta as a way to highlight their flavor. Thankfully I didn't have to grow my own, I just meandered over to the nearest grocery store. Though, undoubtedly they would be more delicious picked fresh, but I digress. 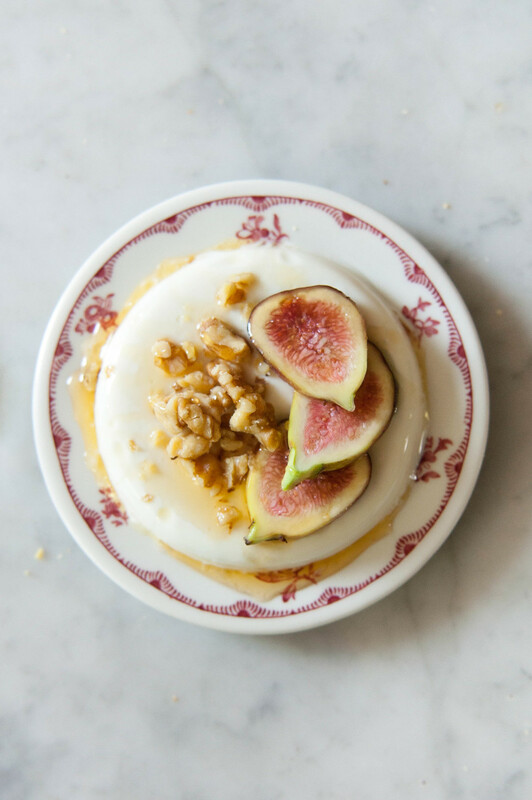 Panna cotta is the kind of dessert that seems really frou frou, but it's actually quite simple to make. The only high maintenance part is the unmolding, but it's completely optional. To me, it seems like an adult version of Jell-o. The kind of dessert that people ease into when they become too refined for neon green jiggly sugar water (don't get me wrong, I'm not knocking on Jell-o, I still love the stuff. Me? Refined? Psh!). You could use any toppings you wish. 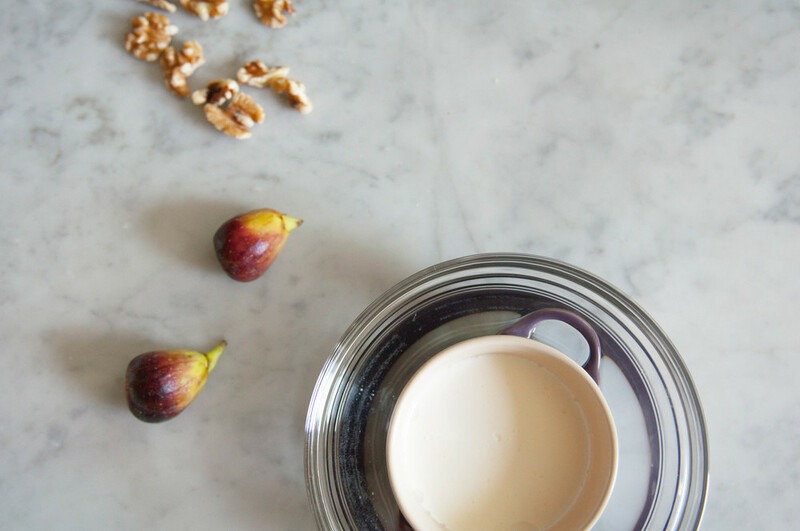 If you do change it up, I would suggest still having something crunchy (walnuts, in this case) or with good texture (figs, in this case) to contrast the smoothness of the panna cotta. Rub a thin layer of neutral oil on the inside of 6 small bowls or ramekins. Set aside. In a small saucepan, add 1 cup of half & half and bloom the gelatin by sprinkling it in one even layer on top. Let sit for 5 minutes. Turn heat to medium low and stir continuously until gelatin dissolves, never letting the mixture get to a boil. Add sugar, vanilla, and salt. Keep stirring until everything is dissolved and you have smooth liquid, again never letting it get to a boil. Add the rest of the half & half, stir, and turn off heat. Split mixture evenly among the six ramekins. Chill in fridge for at least 4 hours. If you're planning on unmolding them, chill overnight. To unmold: in a large bowl, add enough hot water to come halfway up the sides of the ramekins. Dip your ramekins in the water for 20 to 30 seconds. Run a knife around the sides, just along the top, you don't need to go all the way down. Place a small plate on top and invert the plate/ramekin in one fell swoop. Gently lift the ramekin and the panna cotta should easily slide out. 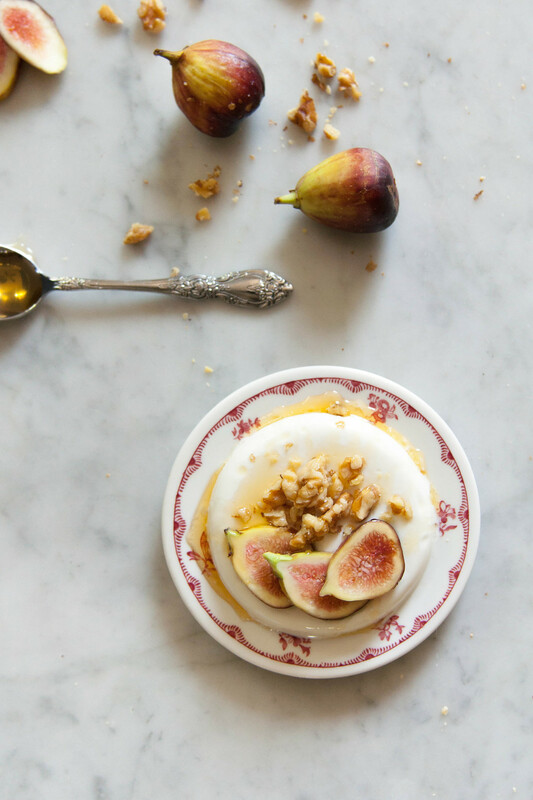 Top with figs, walnuts, and honey. Serve and enjoy!